Yusmeiro Petit is pronounced yoos-mee-ro pe-TEET. When Petit told his parents at the end of high school in 2001 that he wanted to pursue baseball instead of an education, his father gave him a deadline: He had a year to get signed or he would go to college. Petit worked morning, noon, and night—on the field, in the gym, on the running track. The Mets signed him for $20,000 eight months later. In 2004, Petit earned Mets Organization Pitcher of the Year laurels. Petit rose from Class A Capital City to Class A St. Lucie, then finished the year with Binghamton. He led the minor leagues in strikeouts per nine innings (12.92), and he was dominant at all three stops. He went 12-6 before a blister on his throwing hand ended his season during the Eastern League playoffs. His 200 strikeouts were second among all minor league hurlers. In 2005, Baseball America rated Yusmeiro as the second best prospect in the Mets organization, behind only Lastings Milledge. In 2006, the magazine had Petit as 5th-best prospect in the Marlins' organization. During the winter before 2007 spring training, he was dropped down to the #15 prospect in the Florida farm system. During the off-season before 2006 spring training, pitching for Magallanes in Venezuela, this righthander posted a 5-1 record with a 2.01 ERA. In nine games, with eight starts, he tossed a total of 49 innings, striking out 43 while walking just eight. Guillermo Quiroz and pitcher Yusmeiro Petit of Venezuela were first teammates in 1994, when they helped their team from Cocquivacoa Little League in Maracaibo, Venezuela win the country's first Little League World Series title. Petit, then 10 years old, was a backup second baseman; Quiroz was 12 years old and started every game behind the plate. "He was the big hitter," said Petit, who spent most of the 2012 season as a right-handed starter at Triple-A Fresno. "He was the best catcher we had in that area, and we won because of good catching and pitching." Quiroz had long dreamt of visiting the U.S., but when Cocquivacoa arrived in Williamsport, Pa., the players didn't follow the traditional adolescent route and run for the video games and ping pong table. Quiroz remembers that everyone was immediately in awe of the baseball fields. "You saw the nice grass and they gave us brand new baseballs every day," he said. "That's when this all started for me—that's when I knew I wanted to be a professional player." Petit is why we love this stuff. He is why we appreciate resilience and toughness and determination in our professional athletes. He's a reminder that hard work and persistence can overcome countless obstacles. He stands now as a victory for every other journeyman who refuses to give up. For every other baseball player looking for someone to unlock the talent he believes is there. 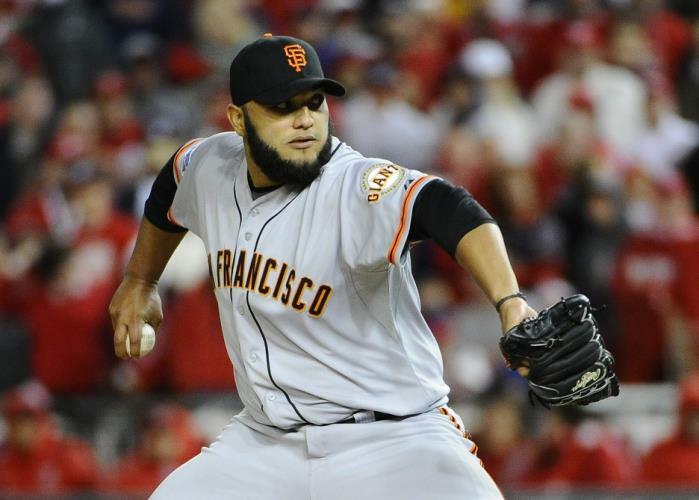 On September 6, 2013, Yusmeiro came within one out of throwing the 24th perfect game in history. He surely got close enough to touch it and taste it and feel it. He retired 26 D-backs in a row by pitching aggressively. That is, he wasn't afraid. He threw a first-pitch strike to 21 of 28 D-backs and worked the outside corners brilliantly. His fastball was located smartly, his breaking pitch wicked. Never mind what went before. Never mind those 11 seasons in the Minor Leagues, those 189 Minor League games. Never mind all the times he was traded (twice), waived (once) and released (twice), or that he spent the 2011 season in the Mexican League. This was his third start since being recalled for the second time. He has won all three, and even before September 6, had pitched well enough to open some eyes. "Experience," he said recently when asked about his improvement. "I wasn't consistent with what I was doing. I'm totally different compared with what I was doing before. I'm more consistent with the breaking balls." Against the D-backs, he threw fastballs, changeups and curveballs, threw 'em all, controlled 'em all. He was brilliant at changing speeds and keeping hitters off balance. When it ended, he was cheered in a way he'd probably never been cheered before. His teammates embraced him one by one. In 2017, Yusmeiro represented Venezuela in the World Baseball Classic. April 24-27, 2018: Petit was on the bereavement list. Nov. 2018: Petit was on the MLB roster for the 2018 Japan All-Star Series with Nippon Professional Baseball. November 15, 2001: Yusmeiro was signed by Mets scout Gregorio Machado, out of Venezuela. November 23, 2005: The Marlins sent 1B Carlos Delgado and cash to the Mets; acquiring Petit, INF Grant Psomas, and 1B Mike Jacobs. March 26, 2007: The D'Backs sent P Jorge Julio to the Marlins, acquiring Petit. November 4, 2009: The Mariners claimed Yusmeiro off waivers from the Diamondbacks. January 17, 2014: Petit and the Giants avoided salary arbitration, agreeing on a one-year, $845,000 contract. December 2, 2015: Petit elected free agency. December 14, 2015: The Nationals signed free agent Petit. Feb 8, 2017: The Angels signed free agent Petit. Nov 29, 2017: Petit agreed to a two-year, $10 million deal with the A's. Petit will make $3.5 million in 2018 and $5.5 million in 2019, with a $1 million buyout. The A's have a $5.5 million club option for 2020. Petit has exceptional stuff and command. He might remind you of a righthanded version of Sid Fernandez. Hitters foul his pitches back like they did with Sid. Though not a power pitcher, Petit gets lots and lots of strikeouts because he is very deceptive and has excellent command. Even though he only has an 86-92 mph FASTBALL, the ball explodes on the batter quickly because of its late, rising life. He can locate this pitch on either side of the plate. (help from Marty Noble-Baseball America-8/14/04). He also has an outstanding 76-79 mph CURVEBALL and an 85-87 mph CUTTER. In 2014, Petit set two MLB records, retiring 46 straight batters as well as 15.3 consecutive perfect innings. 2016 Season Pitch Usage: 4-seam Fastball: 49.4% of the time; Change 13.4% of the time; Curve 16.4% of the time; and Cutter 20.7% of the time. 2017 Season Pitch Usage: 4-seam Fastball: 48.3% of the time; Change 16.6% of the time; Curve 20% of the time; and Cutter 15% of the time. 2018 Season Pitch Usage: 4-seam Fastball: 46.9% of the time; Sinker less than 1%; Change 18.8%; his Curve 14.8%; Cutter 18.8% of the time. Average velocity: 4-seam 90.1 mph, Sinker 89.3, Change 82.8, Curve 77.4, and Cutter 86.2 mph. Petit has a low arm slot and good extension on his delivery, giving him that late movement. His quirky delivery allows him to hide the ball well, making it appear as though the baseball is coming from Yusmeiro's armpit, then exploding on the hitter. Often, the hitter just flails at Petit's offerings, or the batter gets a poor swing and only catches the bottom part of the baseball. He uses his legs real well to drive off the pitching rubber. He repeats his delivery well and throws all his pitches for strikes. He throws to both sides of the plate. Petit has excellent pitch selection and carries out a well thought through plan on the mound. His deceptive delivery and arm angle are things he uses to his advantage. Hitters don't get good swings off him, because he knows how to pitch. "If you're a gun scout, don't come watch him," Portland Sea Dogs manager Todd Claus told Baseball America in 2005. "If you understand pitching and what a big leaguer looks like, you need to come see him. When you throw 3-and-2 changeups down in the zone with late bite, it's cheating. And he's doing all that off a plus fastball." Yusmeiro has the demeanor to handle the ups and downs of pitching in the Majors. He normally stays on an even keel, whether he is winning or losing. Petit's stuff is not overwhelming. He has to command his fastball, get ahead of people and pitch, change speeds. That's his whole game plan. If he elevates his fastball, he can get in trouble in a hurry. He's versatile. That's the great thing about him. On September 6, 2013, making just his third Major League start of the year since joining the rotation as an injury replacement, Petit came within one strike of pitching a perfect game against his former team, the Arizona Diamondbacks. It was broken up on a single by pinch hitter Eric Chavez on a 3-2 count with two outs in the ninth inning. Petit would get the following out, finishing the game with 7 strikeouts and no walks on 95 pitches. The Giants won that game 3-0. The game was Petit's first career complete game and shutout. He was the 12th pitcher in MLB history to lose a perfect game with two outs in the 9th inning. August 28, 2014: Petit made MLB history with the most consecutive batters retired at 46. Mark Buehrle had held the record of 45 since 2009. As of the start of the 2019 season, Petit had a career record of 35-37 with a 4.14 ERA, having allowed 111 home runs and 688 hits in 721 innings. May 9–July 4, 2009: Petit was on the D.L. with a strained right shoulder. 2010: Yusmeiro was on the D.L. the first month of the season. May 6, 2013: Petit was on the D.L.